The wetlands restoration site is located on a tributary to Paradise Creek in a seasonally wet draw with intermittent springs. The draw had been utilized as a horse pasture. The Forbes family, who had recently purchased the property, was interested in enhancing the wildlife habitat value of the land and improving water quality in their watershed. Reed canarygrass, meadow foxtail, and field bindweed dominated ground cover. There was little woody vegetation. PCEI and contractors excavated three wetlands in July 2003. All exposed soil was seeded with native grasses and mulched after construction. Planting native woody and herbaceous plants was accomplished in the fall. The fence surrounding the pasture was removed and all livestock were removed from the area. The Forbes family, Washington State University students in Environmental Science, the University of Idaho Community Service Learning Center, and community volunteers participated in seeding and planting the restoration site. The Forbes family continues to perform weed control and maintenance of the project. 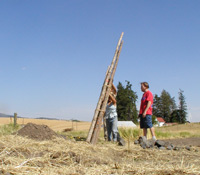 Elementary students from Lapwai Elementary School participated in a camas planting at the site. A member of the Nez Perce Tribe taught the students about the ecological and cultural significance of camas. Then students planted 150 camas bulbs as part of the native riparian plant community. Project installation date: Wetland excavation occurred on July 25, 2003. Plantings were completed in September and October of 2003. This seasonally wet draw with intermittent springs collects a significant amount of water from the surrounding hills and is a tributary to Paradise Creek in the spring. In the past, this draw has been utilized as horse pasture. The Forbes family recently purchased the property and decided to enhance its value as native habitat and improve water quality. Prior to restoration, reed canary grass, meadow foxtail, morning glory, and other invasive weeds dominated ground cover. There was little vegetative diversity at this site. 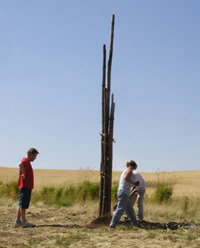 PCEI volunteers and staff erect a habitat structure to increase the hunting ability of raptors and other birds.